If you’re reading this, odds are you’ve already looked at or maybe even invested in at this point. You’ve read the articles, you know the prominent vendors, and you’re up to date on the goings on in the market. You’re what we’d call a marketing automation guru. What you may not be as familiar with are the other solution offerings your automation vendor deals in. Most every company that will sell you a marketing automation solution will also deal in some other type of solution. The variety thereof will depend on the vendor with some of the bigger entities offering just about anything you could ask for. One of the more common products produced by vendors is CRM, as luck would have it. We’ve already discussed the importance of operating with both automation and CRM, so it only makes sense that you try and work with a familiar face when looking for a CRM product. We’ve brought you the shortlist of vendors that can bring you both automation and CRM. HubSpot not only offers a competitive marketing solution but also a free-of-charge CRM product that works very well considering it’s free. “You get what you pay for” certainly doesn’t apply here. Even if HubSpot’s paid marketing product isn’t something you’re interested in, their CRM is a strong contender for your attention with great integration capabilities with too many other solutions to list. In a slight role-reversal from what we established with Hubspot, Salesforce is widely known for its sales tech and has a bit of martech on the side in the form of their Pardot property. Salesforce offers a multi-purpose CRM tool, providing a varied array of competencies covering most sales-related needs. Though favored by enterprises, SMBs are more than welcome to the CRM party as the provider offers different packages to best serve each level of the market. Also included are account/contact management tools and pipeline visuals/management. Pardot is the B2B marketing automation solution from Salesforce. It directly integrates with Salesforce’s CRM to harness all available data. This helps align marketing and sales to generate leads and keep them engaged. Since Pardot’s focus is exclusively on B2B, it helps users prioritize valuable leads through scoring and grading. It captures prospect activity and provides real-time alerts telling salespeople when to contact leads. Blueshift’s automation relies heavily on artificial intelligence to make it tick. As a result of this deep investment in AI, they were ranked as a Cool Marketing Vendor by Gartner last year. The vendor offers a unique take on multi-channel marketing and creatives. By utilizing their predictive programs, users can pit two potential creatives against each other. Using previously input and collected data, an AI will select the optimal creative/template to run with. The product also offers more traditional trappings of marketing automation including a campaign builder tool and trigger-based customer interaction. The vendor’s CRM offerings are, unsurprisingly, also heavily steeped in AI application. The CRM platform is able to predict and report on the “who, what, when and why” of the marketing/sales process. The product’s customer data management platform can provide predictive analytics to users, predict audience trends, and predict engagement time optimizations. ActiveCampaign started as a solution to help business owners keep in touch with their contacts. They grew into a company offering eight solutions but cut it down to one SaaS platform. The platform has solutions for email marketing, marketing automation, as well as CRM and Sales Automation. Their marketing automation tool offers a simple visual overlay, showing users how automation connects the features of each campaign. The platform provides social media analysis, as well as deep site tracking. Enterprise customers will have an “expert level” team member to consult or help with the platform. Formerly known as Infusionsoft, Keap provides both CRM and automation capabilities under their older solution offerings, known as Infusionsoft by Keap. The products are aimed more at smaller enterprises than large-scale titans of industry. Their campaign building program makes them stand out in the automation world, and the CRM collects data about leads and organizes contacts automatically. This hub hosts all sales and marketing tools, so users won’t have to spend their time on daily maintenance. This is by no means a comprehensive list, as many more vendors are invested in both the CRM and marketing automation spaces. 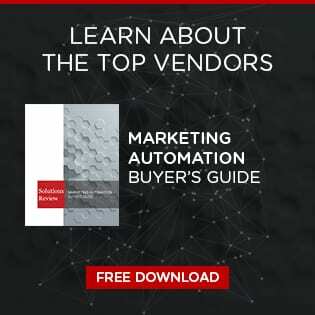 For more information about vendors that offer both types of solutions, consider checking out our marketing automation buyer’s guide for more in-depth looks at even more vendors and what they bring to the table.